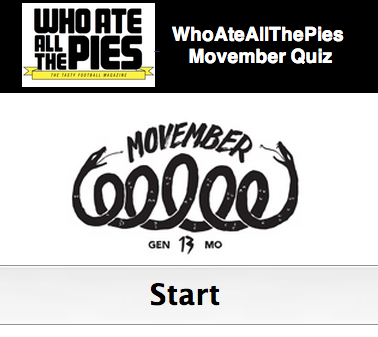 PLAY our Movember Moustache Game and never be bored again (well, until December, at least). I think you should just delete this page and don’t do it again. They’d probably like it on Mumsnet though. I gave up looking at the picture and just clicked on the player who no longer plays, I got them all right from then on. You could certainly make this harder, Pies. Carl – what did we get wrong? Country Gigolo – ok. Harder sounds good. Or more fun. Great game, was a lot of fun! Have to say my own personal effort for Movember is not turning out quite as planned. Also, why do I keep licking what hair has grown up there?